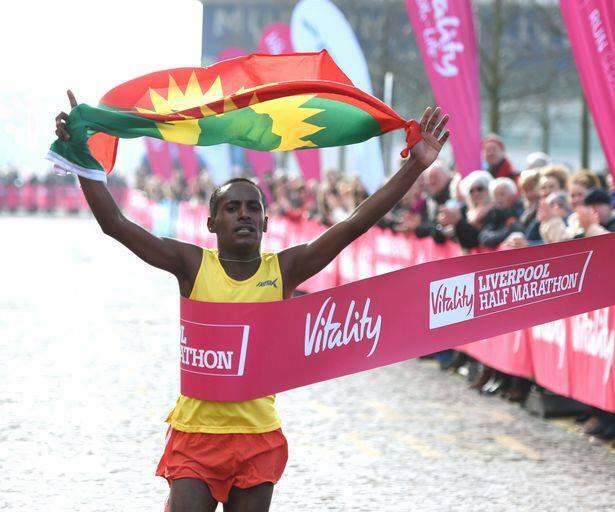 (Advocacy for Oromia, 14 March 2016) Athlete Dejene Gezimu has won the 2016 Vitality Liverpool Half Marathon and raised Oromo (athletic nation) national flag in the events. 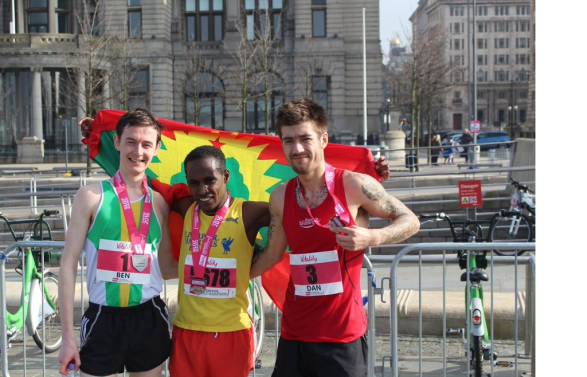 The 22-year-old Oromo athlete, who has a string of other race wins under his belt, recorded a personal best for the half marathon with a time of 01:06:59 – averaging five minutes and seven seconds per mile. He was 50 seconds faster than his nearest rival, Benjamin Douglas, who was runner-up. The fastest woman to finish the 13.1-mile course, run in warm sunshine, was Michelle Nolan in a time of 01:20:20 – averaging 6 minutes and eight seconds per mile. Meanwhile the winners in the 10 mile race were Connor McArdle, on a time of 58 minutes and 41 seconds, and Michelle King in 01:11:26. Here are the top five male and female competitors in each of the races. Posted on March 14, 2016, in Uncategorized. Bookmark the permalink. Leave a comment.